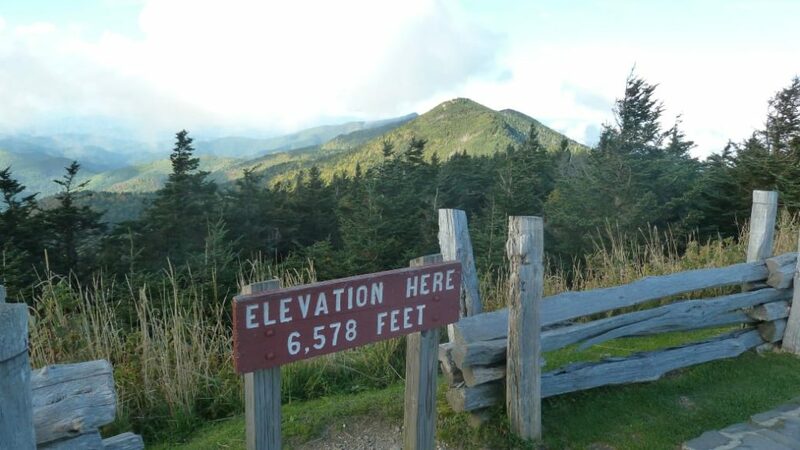 There’s a bit of Tarheel pride in the fact that Mount Mitchell is the tallest mountain east of the Mississippi River. So important is the peak that, in 1915, it was named the first state park in North Carolina. Mt. Mitchell didn’t just help to create N.C. State Park system though. At 6,684 it’s also responsible for creating its own climate and weather. Because of its height, the climate at the top of Mt. Mitchell more resembles that of forests in the U.S. Northeast and Canada. During the Pleistocene era (pronounced play-stuh-seen so you can impress your friends), things were a bit colder in the region. Cooler temps allowed plants and animals normally found in northern climates to head south. Things warmed back up and these colder climate loving travelers were relegated to the highest peaks where altitude keeps things a bit chillier. Lower average temps aren’t the only weather patterns that the mountain seems to control. On even otherwise clear days Mt. Mitchell can be ringed by mist. Warmer, wetter air is pushed to the top and cooled, condensing ambient moisture and creating a cloud. Unpredictable storms and wind are a common result. The chance to view the world from on top of the east coast and watch the sunrise over the mists that settle in the valley more than make up for the unpredictable weather. While the roughly 12-mile round trip is commonly completed as a day hike, the best way to experience the all that the mountain has to offer is by taking an overnight backpacking trip. The trip starts at the Black Mountain Campground, roughly an hour long drive from Asheville. Operated by the Cradle of forestry, this 46 site campground is a good accommodation alternative if you’d rather make the trek sans backpack. For this backpacking trip, though, you can park your car at the BMC lot at no charge. From the BMC hit the Mount Mitchel Trail. After a steep climb, you’ll get to, well, more steep climbing. The backcountry camping area is four miles in on Commissary Ridge. It’s easy to spot as the trail flattens and you break free of the forest. Walk a few steps on the double track path and the meadow, complete with several obvious fire rings, is on the left. Look around. There are some really nice but less obvious spots to set up camp located just down a small hill from the meadow. The stream you walked through on the way to your campsite is your water source. Filtering is a great idea unless you’re looking for a quick way to lose some pre-holiday weight. Once you’ve ditched your pack and set up camp, finish the final 1.6 or so miles to the top of Mt. Mitchell. There are a couple different trail options near the top, it doesn’t matter which you take. As long as you’re going up, you’re doing it right. As soon as you pop out of the forest again you’ll step onto the parking lot. There’s a paved road that brings drivers to the peak. (This explains why you saw the guy in motorcycle gear carrying a 20-ounce soda on the trail a few minutes before). At the top, you’ll find bathrooms, a nature center, and a snack bar. The near famous elevation sign is to the right and the trail to the observation tower is to the left when facing the buildings. The 360-degree view from the tower makes the entire effort worthwhile. After you’ve had your fill at the top, return to your campsite using the same trail you took up. Find a good seat for sunset. The mist settles in the lower valley for the evening and reflects the oranges and pinks of late afternoon. The best place to watch might be just past the campground on the dual track road. You can usually find firewood in this area as well. Prepare for temps 10 degrees or colder than in Asheville. Bring appropriate rain gear even on the driest of days (you don’t want to be the one who temps fate just to save 8 ounces in your pack). And most importantly, have a good hike to the highest point east of the Mississippi!